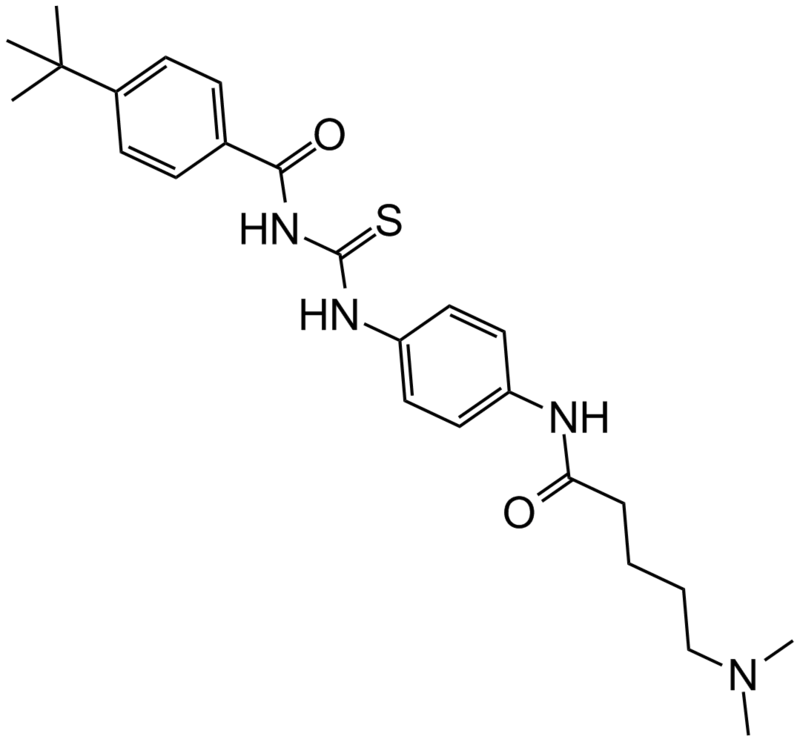 Description Tenovin-6 is an inhibitor of sirtuin with IC50 values of 21 µM, 10 µM and 67 µM for SIRT1, SIRT2 and SIRT3, respectively. Assays were carried out using purified components in the Fluor de Lys Fluorescent Assay Systems. Relevant FdL substrates were used at 7 mM and NAD+ was used at 1 mM. Tenovin-6 was solubilized in DMSO with the final DMSO concentration in the reaction being less than 0.25%. For SirT1 and HDAC8, 1 unit of enzyme was used for each reaction, and for SirT2 and SirT3, 5 units were used for each reaction. Reactions were carried out at 37 °C for 1 hr. After 24-hr culture, Tenovin-6 showed a significant dose-dependent cytotoxic effect to CLL cells. In CLL cells treated with Tenovin-6 (10 μM) for 8 hrs, the metabolic activity reduced substantially, which was similar to the effects of Fludarabine (3 μM). In female SCID mice bearing ARN8 melanomas, Tenovin-6 significantly reduced tumor growth (day 6, p = 0.045; day 11, p = 0.0179; days 13 and 15, p = 0.0247). Tenovin-6 is an analog of tenovin-1 with more water-soluble and it inhibits the protein deacetylase activities of SIRT1, SIRT2 and SIRT3 with IC50 value of 21 μM, 10 μM, and 67 μM, respectively . It has been identified that　the cytotoxic effects of　tenovin-6 may occur through the dysregulation of autophagy rather　than induction of apoptosis in chronic lymphocytic leukemia cells. Sir2p homologs could be targets　for tenovin-6 in mammalian cells. Tenovin-6 decreases purified human SirT1 peptide deacetylase activity in vitro with an IC50 of 21 mM and human SirT2 activity with an IC50 of 10 mM. Inhibition of SirT3 by tenovin-6 in this assay was significantly lower with an IC50 of 67 mM. And the activity of HDAC8 is poorly inhibited by tenovin-6 with an IC50 above the highest concentration of 90 mM. In xenograft models, tenovins induce apoptosis in malignant cell lines, containing those derived from lympho-reticular neoplasia and decrease human tumor growth. Anti-leukaemic properties of Sirtuin inhibitors have also been demonstrated in recent pre-clinical studies on Tenovin in chronic myeloid leukaemia and Nicotinamide in CLL15 associated with increased p53-pathway function [1, 2]. Tenovin-6 has potent antitumor activity against human gastric cancer cells via DR5 up-regulation. Interestingly, tenovin-6 induced apoptosis in the cell lines, those with wild-type TP53, mutant-type and null versions, which were accompanied by up regulation of death receptor 5. In the KatoIII cell line ( TP53-null), death receptor 5 silencing markedly attenuated tenovin-6-induced apoptosis, indicating that the pivotal mechanism behind its antitumor effects is based on activation of the death receptor signal pathway. Tenovin-6 combined with docetaxel or SN-38 exerted a slight to moderate synergistic cytotoxicity against gastric cancer cells .